Filled with a stuffing full of flavor and spices and baked to perfection. These are a Thanksgiving must have. Clean mushrooms by using a damp rag and removing any dirt. Remove stems from mushrooms and dice the stems. You will use them in the stuffing mixture. Heat up the butter in a fry pan while you mix the breadcrumbs and seasonings together. In a large bowl mix together breadcrumbs and all seasonings such as parsley, basil, oregano, onion powder, garlic powder, vegan parmesan, and salt and pepper. Pour mixture into fry pan with melted butter. Add in 1 tbsp of avocado oil too. You want the entire breadcrumb mixture to be moist and covered in butter and oil. Cook this on medium heat ensuring even distribution of moistness throughout all of the breadcrumb mixture. Cook this until golden brown and it sticks together well. To test you can pick up some with your hands (be careful it will be hot) and mush it together to see if it stays, which is should. Remove the breadcrumbs from the fry pan and add in the diced mushroom stems to the fry pan. Cook them in the remaining oil and let them get brown. Once done mix in with bread crumbs. Preheat oven to 350F and line an 8x8 baking dish or cookie sheet with parchment paper. Now it's time to stuff the mushrooms! 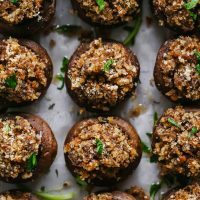 Fill each mushroom up with however much breadcrumb stuffing you'd like. I really like to stuff mine leaving a mound on the top. When stuffing them press down with your spoon without breaking the mushrooms and fill to the top letting it come up and out a bit. Drizzle tops of mushrooms with 2 tbsp of avocado oil, making sure to get some on the tops of each mushroom. Sprinkle tops with extra vegan parmesan cheese then bake for 20 minutes. Once cooked you can garnish wit fresh parsley. This amount of stuffing is good for a little over 12 medium sized white button mushrooms. Double or triple this stuffing recipe for any amount you intend to make.